Spicy Mac and Cheese - A recipe from Savor California, the online showcase for extraordinary gourmet foods and beverages from California. A twist on mac and cheese combining spicy and salty, with a dash of sweetness. Drop macaroni with salt into 3 cups rapidly boiling water. Bring back to rapid boil. Cover with a tight-fitting lid, remove from heat, and let stand 10 minutes. Rinse with hot water. Drain. 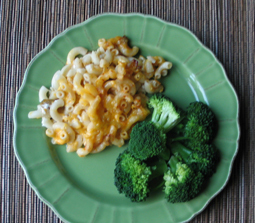 Place alternativing layers of macaroni, cheese, and jalapeño relish in greased 1-quart baking dish. Sprinkle each layer with the salt and pepper. Add milk. Bake 35 to 45 minutes, until golden brown on top.